Red Valkyrie is an interesting top-down action game in which you have to explore large space stations with airlock doors serving as checkpoints. To uncover new areas, the player must first activate switches which are usually surrounded by enemy robots or defense turrets. Pretty fun, though the textures are slightly dated. 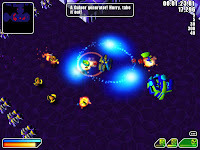 The same airlock gameplay concept can also be found in Mutant Storm Empire.